Lyrically, “Christmas in the Room” starts off with negation. “No travel bags, no shopping malls / No candy canes, no Santa Claus.” It’s an interesting way to describe what something is: by highlighting the things it isn’t. And by describing the things that aren’t there, the song starts out a somewhat uncertain, bittersweet note. No traveling to visit friends or family that live far away, no partaking in the rush of Christmas shopping. No Santa Claus seems to be a stand-in for loss of childhood innocence (as it often is), or at least the childlike wonder at Christmas. But the next lines do cast this in a slightly different light: “For as the day of rest draws near / It’s just the two of us this year.” For all the things that aren’t there, there’s something new: Christmas together with someone important. The word ‘just,’ though, does keep this contentment in a somewhat muted glow: it’s just the two of us this year. Although as a whole, I’d certainly say this is a happy song, the first verse paints a somewhat sombre picture. Before the chorus, we get one more image of the couple: “No silver bells or mistletoe / We’ll kiss and watch our TV show.” Again, there’s an absence of Christmas traditions and conventions. There’s just the two of us. Kissing and watching ‘our TV show’ paints a pleasant picture of domesticity, but it’s still framed by what’s missing. As pleasant as it is, I can’t help but feel an underlying question: is this all that’s left? Moving away from home, living with a partner for the first time, and becoming self-sufficient are milestone moments, and it’s often the holidays when the import of these changes can be felt to the fullest degree. Two contrasting feelings rise to the surface: with everything we gain, we’re leaving something else behind. Even if things look good from one angle, if you shift the frame you can feel everything that’s missing, everything that’s not quite as warm as you’d wished. Pictures are usually a big part of Christmas gatherings. They’re a time for everyone to smile and look happy. If these pictures are what we strive for – what we nostalgically long for – then it’s what lies outside the frame that “Christmas in the Room” is considering: the moments that aren’t picture-perfect. The moments that make up most of the holiday experience. Both the first and second chorus employ a subtle word choice that, for me, really highlights the beauty of the message in this song (not to mention Sufjan’s incredible skill as a songwriter). It starts, “I’ll come to you, I’ll sing to you / Like it’s Christmas in the room.” There’s a sweetness in the act of singing to someone, but also there’s the idea of pretend: “like it’s Christmas in the room.” Conversely, the chorus ends with, “I’ll dance with you, I’ll laugh with you / Until it’s Christmas in the room.” The shift from ‘like it’s Christmas’ to ‘until it’s Christmas’ is, again, subtle, but meaningful. What Stevens is describing is not just singing, dancing, and laughing as if it were Christmas – as if this smaller, more modest ‘Christmas in the room’ were as special as those that came before. No: it’s singing, dancing, and laughing until this Christmas really is as special as Christmases past. It’s a ‘fake it till you make it’ for the holidays. The second verse covers similar ground to the first, but the scenes described and compared here cast the ‘Christmas in the Room’ in an increasingly positive light. Whereas the first verse highlights only the nice things the couple is missing out on (candy canes, Santa Claus), this one draws attention to some of the less glamorous parts of the holiday season: traffic jams, and ice and storm. By contrast, “Far in the house the fire is warm.” The Christmas together in the room is a sort of safe haven. The next lines are “No Christmas tree, no great parade / It’s just an ordinary day.” Depending on how you interpret this, it can either be a somewhat sad sentiment, or something profoundly beautiful. It’s true that, as we get older, the ‘joy’ of Christmas has a tendency to diminish. It’s not for nothing that countless movies and shows have reused the trope of ‘adults not being able to see Santa Claus simply because they don’t believe.’ Whereas children are free to focus on the presents, sparkling lights and excitement, adults, by necessity, have to consider the starker realities, which isn’t necessarily conducive to joy. So when Stevens says, “It’s just an ordinary day,” we can take it to mean that Christmas no longer feels as special as it once did. But I think there’s a more optimistic view; one that’s reinforced by the bridge. And that’s that this ‘Christmas in the room’ feeling – the familiar love between the couple central to this song – is neither confined to nor created by Christmas. The bright lights, festive spirit, and happiness of the holidays are exciting – extraordinary even – but an ordinary day can be beautiful too. There are “no parties planned, no place to go / It’s just the two of us alone.” We don’t find out why there are no parties or places to go, and again, the lines are tinged with a certain sadness. But there’s an interesting idea present, here, too: it’s just the two of us, and we’re alone. This idea of being together yet alone is somewhat ambiguous. Do they feel alone, even when they’re together? Or have they become so solidly intertwined as a couple as to feel lonely together, as one unit? The last lines of the second verse are repeated in the third verse: “And in the house we see a light / That comes from what we feel inside.” But as with the chorus, there’s a subtle change in wording the second time around. The line “…what we feel inside” becomes “…what we know inside.” The change in meaning is actually quite similar to the chorus’ word switch: what starts out as a possibility the first time around, turns into something certain. And it almost seems to reflect the growth of a relationship: what starts out driven by feeling becomes more considered over time; we remember the reasons we fell in love. And now, we find ourselves at the bridge. 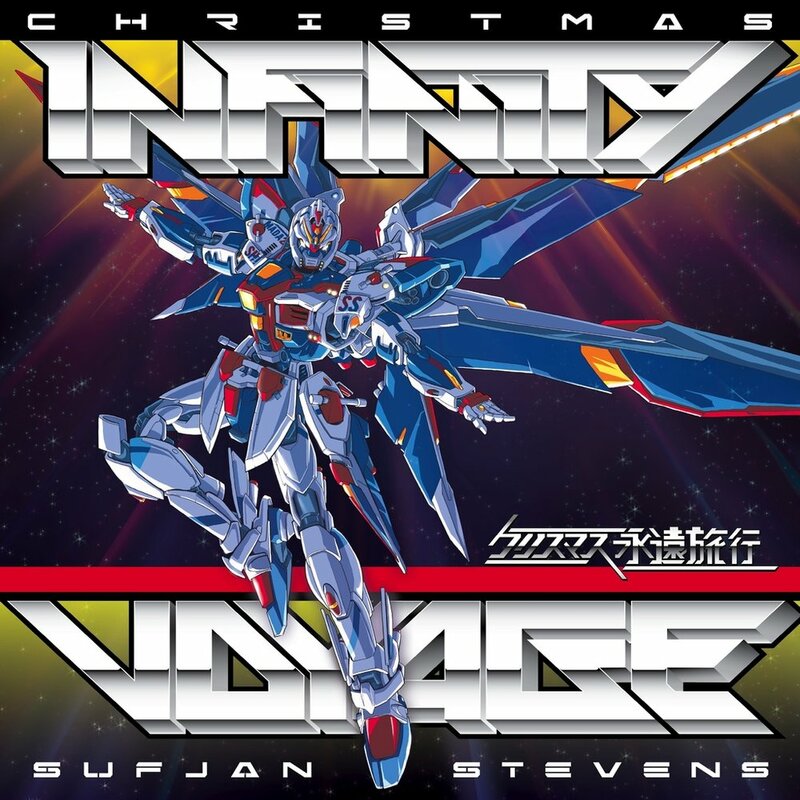 For a song with so much imagery and sentiment loaded into the first pairs of verses and choruses, Sufjan Stevens still manages to save a burst of stirring, compact intensity for the bridge in “Christmas in the Room.” Before we get into the lyrics, though, let’s take a quick look at the music (insofar as you can ‘look at’ music, sans synaesthesia). There are two versions of “Christmas in the Room:” the comparatively lo-fi, piano and synth-driven original from 2008, found on “Astral Inter Planet Space Captain Christmas Infinity Voyage: Songs for Christmas Vol. 8;” and the glistening, banjo-and-backing harmony beauty from 2012’s “Christmas Infinity Voyage: Songs for Christmas, Vol. VIII,” part of the Silver & Gold box set. I’ve been using the newer version as the backdrop for this write-up, so I’ll just say briefly that my favourite part of the original is the warbling synth that comes in and out of focus behind the steadily bouncing piano chords; it has a sort of classic Christmassy sound that I think works really well. Sufjan’s voice on the original is less polished, and feels more uncertain – which brings to mind the scene depicted in the song, of the couple singing together not as a performance, but as an expression of joy. On to the Silver & Gold version of “Christmas in the Room.” Firstly, whenever Sufjan Stevens brings out the banjo, you can be certain things are about to get poignant and pretty. And “Christmas in the Room” features some of Sufjan’s prettiest, most poignant banjo playing of all time (no offense to “Casimir Pulaski Day”). The additional reverb on the repeating banjo figure accentuates the drifting, sombre melody, and makes the song feel almost dreamlike, like an echoing reverie. As always, Stevens’ voice has a warm tenderness to it. He sings quite softly for most of the song, which feels quite appropriate given the intimate setting and subject matter. One of the parts I’ve always loved is the way the melody gently expands in the second verse, stretching slightly further than in the first; it’s as though the light and love described are having an effect on the narrator’s voice. Throughout, the background vocals serve as a wordless, celestial backdrop, giving the song an almost hymn-like atmosphere. It’s during the bridge, though, that “Christmas in the Room” really blossoms. With a sudden crescendo, and the addition of stronger rhythmic elements, the song takes on a more forward-marching pace, as opposed to the drifting nature of the verses. Stevens sings with much more passion than before; the melody hits higher heights and lower lows; and then in the final line, the vocals dissolve, as if it’s all just too much to bear. I don’t think we need to understand the first line as suggesting that death is imminently near. One possible interpretation of this song is that one (or both) of the couple has a terminal illness, hence the time alone in the room. But that interpretation doesn’t seem necessary to understand the song. Stevens says he can see the day we’ll die, but that doesn’t need to refer to a specific day; it can be a feeling, or an image of the aftermath. Death is unpredictable and unfair, and by saying he can see when we’ll die, Stevens is also accepting the simple truth of it: that we will all die. Even the most beautiful moments are ultimately fleeting and finite. I find it incredible that a collection of (comparatively) casually-put-together Christmas tunes (Stevens originally recorded the EPs of carols and original compositions as gifts for friends and family) can carry so much meaning. Christmas songs are often simple, straightforward things – “Dashing through the snow / In a one-horse open sleigh” – yet Stevens has managed to elevate the form; in this case, to a solemn, bittersweet contemplation of death, love, growing older, and meaning. Perhaps I was touched by death too often at too young an age, but I’m always drawn to works that address dying. This is just one aspect of “Christmas in the Room,” and one that only really surfaces in the second half of the song, but I appreciate the sensitive, honest way it’s approached: there’s no sense dwelling on silence when we’re alive, here and now. Hear and know. Of course, Stevens would go on to write Carrie & Lowell, a much more direct, heart-wrenching, and thorough examination of the subject, but in the space of a few words, “Christmas in the Room” manages to say quite a bit. One of the core messages of “Christmas in the Room” is that, no matter what else is missing, the couple at the heart of the song is able to find their greatest happiness in each other. There are “No gifts to give, they’re all right here / Inside our hearts the glorious cheer.” But although Sufjan Stevens is holding up the familiar love of a couple in “Christmas in the Room” as a beautiful thing – highlighting the idea that their love for one another is worth more than any Christmas frills – the song’s message extends beyond just couples. There may be Christmases we spend surrounded by loved ones and laughter, family and friends, and Christmases we feel isolated and alone. There may be Christmases spent in love, or Christmases spent lamenting love lost (the weeks leading up to December 25th are, in fact, among the most popular for break-ups). There may be happy Christmases and sad ones. We grow older, but we can still find joy – even if it’s a slightly subtler joy – in the comforts and pleasures of an ordinary day. And on the days when we feel most down, we can sometimes find the strength to make things better in the simplest things we do. Whether that’s laughing and dancing, or even shifting your focus from dark, distant thoughts to the more beautiful things around you, we can cultivate the tools to try and make the most of life. We can do the things that make us happy until we are happy; until it’s okay; until it’s Christmas in the room. Will Kummer is a writer who’s lived in several cities across southern Ontario, and presently resides in the Waterloo Region. He writes everything from essays and stories to alliterative poems, on subjects ranging from real estate to the picaresque exploits of a whimsical cast of characters (sometimes both at once). His favourite Christmas tradition, aside from Sufjan Stevens’ Christmas songs, is the two foot tall, inflatable Santa Claus he got from Dollarama two years ago; they have spent “Christmas in the Room” together ever since.